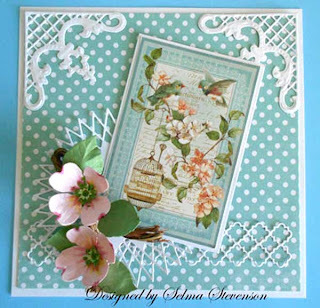 Today I am excited to show you the chart that Selma has made using all of the new Susan Cockburn dies that are available. A few have already sold out, but are due back in the middle of the month. We are interested in knowing which flower is your favorite, so if you leave both of us a comment a winner will be chosen from a random drawing and announced Wednesday morning. The winner will win the NEW Garden Leaves ($18.99). I have a picture of them below. 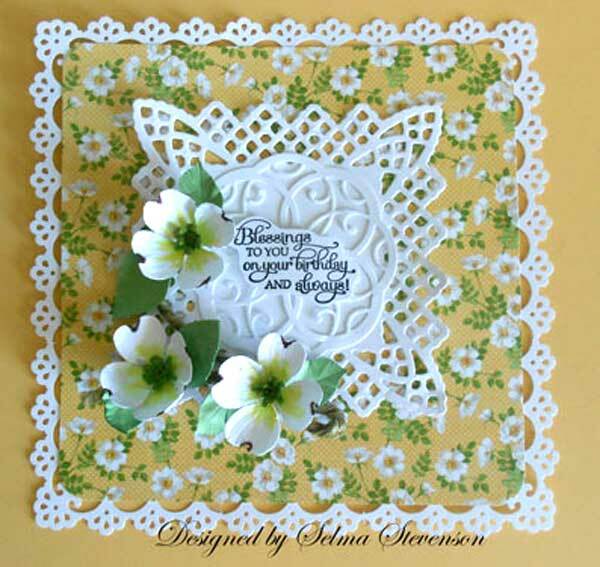 I am also showing some cards that Selma has created using some of the new flowers. So, keep scrolling down to see all of her beautiful work. Remember, leave a comment on this post and also on Selma's of your favorite flower. 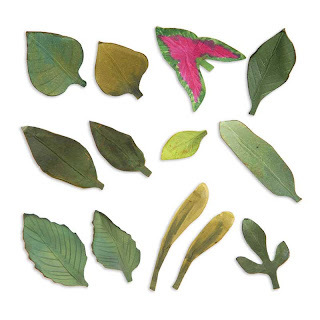 wonderful set of Garden Leaves by Susan Cockburn. 656413 valued at $18.99. You have until 4-7-13, Tuesday night 11:59 PM. The winner will be announced on Wednesday morning. I am totally in love with the Dogwood flowers. They look very realistic. Right now they are in full bloom here, and they are extra gorgeous this year! I really like the Pink Dogwood! Beautiful work! Love all the flowers but especially the rose. Would love to have them all.....Selma creations are all amazing. WOW! How to choose a favorite would be impossible! They are all so beautiful and real! But if I had to pick I would have to say the pansy-it is one of my favorites to plant in the spring-I love looking at their funny faces! They are all so beautiful. But I think the pansy/violet is my favorite. Those are my favorite flowers. Such talent, Thanks Selma! Great job. I think the delicate quince is my favorite. They all look amazing realistic. We have a pink dgowood in our front yard and this one looks so much like it! Love them all but will pick the Sunflower. Absolutely LOVE the rose!! Simply stunning!! I LOVE all of them! I think my favourite is the mini daisy though. All of them are gorgeous! Being a flower gardener, the choice is hard...but I have to say that Roses hold a special place in my heart, so it has to be the beautiful Rose, she created.....but they are all lovely!! These new dies are gorgeous! Love the cards! These are absolutely beautiful!! I love them all & so enjoy seeing Selma's "creations"! They are all gorgeous, but the dogwood is my favorite! My favorite flower is carnations but since you dont have that listed I will have to say the poppy and Rose comes next, although they all are beautiful. Love the ideas and creations you both put into it. I love all the flowers...but that dogwood and Rose are stunning. I guess it would have to go to the Rose as the favorite..it looks so real. My favorite is the dogwood and rose. Thanks for a chance to win. I would have to say pansy/violet, I love the wild violets that come up in May. Wow! What a gorgeous collection of flowers! Selma does such a wonderful job creating these! I love them all! :) However, knowing that I could only choose one, I picked the Dogwood! Sorry Rose! Thanks! wow is right!!! adorable flowers and so hard to choose a favourite, but if I have to say one...pansy/violet! Oh I hope I win! thanks for this opportunity! I love all of these flowers because they look so real and who doesn't love flowers. What an amazing work of art Selma has made. My final pick is the Roses. These dies create such exquisite flowers. I would love to have them all! Beautiful! Gorgeous results, Selma. The flowers are all stunning, but I think my favorite is the dogwood. Joan, All these flowers are just gorgeous and it's so hard to choose a favorite. I have always loved the Dogwood though because of the symbolic meaning. Thanks for giving the chance to win this wonderful die. Oh my gosh, such a hard choice to make as love them all. But guess the dogwood is my first choice, followed by the rose. I have a couple of the dies but want to get more. Edna B. The flowers are all gorgeous- I will have to go with the dogwood too- and a close 2nd are the roses : ) My daughter is in China teaching, so I am drawn to oriental cards now, and the dog wood looks like the plum tree blossom too : ) Thanks for a chance to win! Wow they are all so pretty! They look very real. I think my favorite is the pansy/violet! Wow Selma does such great work! The flowers look so real! As I mentioned to Selma, the rose is my favourite, but I'm completely amazed at ALL of them and how beautiful they are - AND your fab creations! The rose looks so realistic! All I can say is WOW!!! WOW! Fabulous work Selma! I don't think there is a better 'flower maker' out there than Selma ... she has perfected these paper flowers to the point of not being able to tell REAL from PAPER! Fantastic and such an inspiration! I have two favorites ... the dogwood and the rose. So beautiful and life like! Thanks for all you ladies do!! The flowers are amazing and more realistic they could not be. The rose looks so real I can smell it from here. My favorite is the hibiscus. The blooms are so beautiful. Even if they do only last a day, another one always pops out the next day.I now live where there are too many deer who also seem to enjoy the blooms. Ooh tough choice. The daffodil is gorgeous and I haven't see a die that does that. I'd have to say that's my favorite. These flowers are just amazing. I really love the rose. They are my favorite flowers. Wow I love all the flowers, they all look so real. Looking forward to owning the dog wood. They are all beautiful but I think the rose is the best, so realistic. I love the rose as it is my favorite flower. Selma's done a fabulous job with these new dies. I've owned Susan's books for years and with the new dies it couldn't get any easier to make fabulous looking flowers. They are all so BEAUTIFUL, and I've been a fan of Susan's flowers for some time. I'm glad to see this new series of dies from her and Sizzix. My favorite is the Dogwood. I'm a Georgia gal, and the dogwoods are abundant in my state. In the spring they are so beautiful (except this year, for some odd reason, there was an unknown state-wide problem and they didn't bloom well). Anyway, as much as I luv ALL the flowers, I have to stick with the Dogwood (with the Lily being my second choice). You are one lucky lady to have Selma design for you! 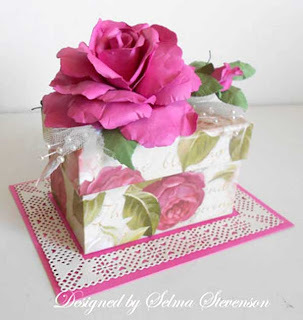 Selma does such a beautiful job creating her cards and boxes. I would have to say my favorite is the poppy. My sister has the most beautiful poppies in her yard and Selma has duplicated that beauty. I love love love the pansies!!! I would have to pick the sunflower first but the hibiscus runs a close second! Selma is doing wonderful job with these dies! Hope you had a wonderful weekend and are still improving each day, will post you privately later, want to make some flowers!! With my new dies!! So far I love them ALL!!!!!!!! But I think my favorite is the Dogwood, going to make that one today, will post you a picture of the card when I am done, hopefully nothing takes place that takes me away from my craft room today, was supposed to go to the Dr., but their office canceled it till tomorrow, so hopefully a day of rest at crafting. Thanks to Selma for the chart, I have also been watching most of Susan's videos on You tube. Thanks for a chance to win!!! I love my dies!!!! I love the pink dogwood, but the rose is my favorite. It is so hard to choose when they are all so pretty! I like the pink dogwood and the daisy! Thanks for all your loving effort in supplying us with such great tools! All of the flowers are so beautiful it is hard to choose just one but I do really love the roses and the sunflowers - also the dogwoods. Selma, you did such a wonderful job on the flowers and making the chart. Joan, thanks for all you do to see that the latest and the greatest is available to us! Oh my... these are ALL gorgeous!! I really like the dogwood and I'd pick that first because dogwoods are one of my favorite springtime flowering tree. These dies have them perfect and Selma has created them so realistically. The pink dogwood is my favorite, reminds me of my grandmothers house in Missouri. She had 3 of them in her yard. How Beautiful!!! 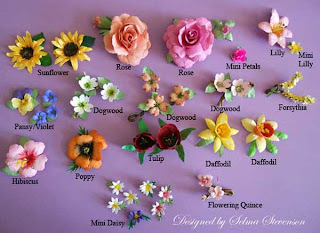 It is hard to pick a fav out of all those beautiful flowers, lol, let's see, hummm, the rose, the poppy, the dogwood, lol! I like them all!!! Hi Joan, I am from South Africa and just love creating flowers and I Hv found Site very helpful. Thanks. Before I lost my Mother, roses where her all time favorite flowers. Your pink rose in this set is awesome as well as all of the flowers. Thank You for sharing your beautiful work. The sunflowers are my favorite. They exude summer. All of these flowers are beautiful! I love all of the flowers. They are so lifelike and you do such a wonderful job making them. My very favorite is the Dogwood. Beautiful! 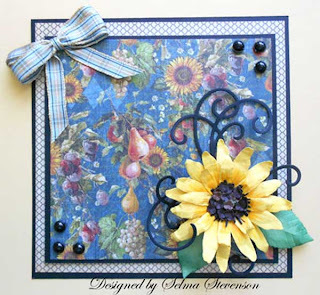 My favorite is the sunflowers--they remind me of my grandma. The Dogwood is probably my favorite but it was a difficult choice. I'm a real rose fan and very traditional. However, I love any dogwood stamps, and now these flowers are gorgeous. Selma has done a fabulous job making them up. Joan, I hope you are feeling better. It's a long road with a knee replacement. I know from experience. Thanks for the chance to win the goodies. :0) Have a great week everyone! Gorgeous flowers! I love them all, but my favorite is the Pansy/Violet! Always has been one of my favorite flowers! Thanks for the chance to win a prize, Joan! Very nice! All of these are gorgeous. It is hard to pick, but I guess my favorite is the rose. So lovely! I don't know if you mean my overall fave or just from the chart. I love the peony best but from this chart, the pink dogwood. But they are all gorgeous! My favorite would be the pansy...however, there is not a bad one in the bunch - LOL! All are beautiful creations! They are all gorgeous, I love the pansy but my favorite is the pink dogwood. I can't wait to try them for myself.. The dogwood is my favorite, followed by the rose. Selma makes the most beautiful flowers. These are all stunning , but if I have to pick a favourite then the Dogwood. I love the dogwood card Selma made, my favorite is the dogwood..
Every flower is amazing! I love the realistic leaves, too. If I have to choose, however, I would choose the poppy. It is dramatic and fragile, all at the same time. would love to make it with red CS. Thanks for the chance to win. WOW! Each flower is amazingly beautiful. My fav is the Hibiscus. All of Selma's flowers are awesome and especially the beautiful rose on the box. However, my favorite for me is the Dogwood. I think the leaf set would be so great to have. Thanks for all you share! I would have to say that my favorite flower is th Pansy. I have always loved Pansies and Selma makes them really beautiful. Oh my gosh! More flowers! They are so beautiful!! I have just been making Selma's baby's breath using her tutorial. They are gorgeous. I think they need to be made up in advance so they will be ready when they are needed. Your work is a-m-a-z-I-n-g!!! They are all beautiful, but I have to choose the dark red tulips. A change from pastel. Love them and they are divine! These flowers take my breath away! The daisies make me smile. The dogwood is sneaking up to a close second these days! Selma is soooooo amazing! We are so blessed she shares her talents so freely. We all love our own favorite flower in this wonderful world of so many to choose from. The great thing about this new medium is it makes making the flowers Selma has always been so great at a little easier for all of us. I always know summer is just around the corner when my Forsythia bloom and that for me is the favorite because this makes making three demoniacal so easy for them. Thanks for the opportunity to enter this contest. I love the mini daisy. I really hope that your feeling lots better by now. It's so hard to pick a fave flower from this set but I think I like the poppy the best with the dogwoods a very close second.- thanks for the chance to win this great leaf set. I just love all ofthe flowers, it is so difficult to choose. Ilove daffodils and the pansies, hibiscus, sunflowers and forsythia are beautiful but, the rose is just exquisit! Thank you for the chance to win! I really love these new flower dies! These flowers are all so beautiful, it's hard to pick just one as a favorite! I love the dogwood and rose and can't wait to see Selma work her magic on the peony! Thanks for the chance to win and for all the inspiration! All are so beautiful! My fave is that gorgeous rose! Thanks Selma, for the inspiration! Thanks Joan, for the chance to win! My favorite flower die is the dogwood. It is beautiful. What a tuff choice? I would have to say the lily is my favorite choice Selma. You've done a lovely job on that rose. Wow! Selma's creations are stunning and a lot of hard work has gone into them! If I had to choose it would be the Dogwood its so simple yet a lot can be done with it . Hibiscus, flowering quince, poppy and /but they are all wonderful. Thanks for the chance. I think these are so real looking. I can't wait to get the set to make my own. They are all !! My favorite is Dogwood. Thanks for being an inspiration and sharing you projects. All Selma's flowers are gorgeous but my favorite is the rose! I love flowers and these are gorgeous but the pansy and violets are by far my most favorite. Sweet, simple flowers that remind me of my dear mom and her beautiful garden. Incredible how realistic these are!Loving the roses and the daffodil. Makes me homesick to see them. Just beautiful! This is such a tough decision. The poppy and dogwood are so realistic, but I'd have to say the rose is my favorite. They're just gorgeous! All the flowers are beautiful, but I sure do like the Dogwood!!! I have the lily, but I'm really loving the dogwoods. They are beautiful! like grounds, around the cow and chicken farm, wow what lesson, And when it came to flowers, well they knew so much-hiw I wish we could have Brain transplants! Love all the flowers but if I can only choose one, I'd pick the rose. Thanks for the opportunity to win. Beautiful! I like Flowering Garden! That´s a tuff one, cause I really love them all, but if I have to choose, then it has to be the rose and the lillies, cause I really love both these sooo much at amy time. But they all looks soo fantastic here as Selma has made them all up and her cards and boxes are sooo gorgeous. Thanks sooo much for the chance to win this set. I love everyone one of the flowers that Selma has created. She is just uber talented. I think though that for me the dogwood is my favourite as it just takes me right back to my childhood and seeing all the wild dogwood blossom on trees along the road and banks in and around my childhood home. Thanks so much for sharing all your talent Selma. Very beautiful flowers created by Selma, as she always has the gift to give us all the flowers tastefully and I thank wholeheartedly. I gotta go with the roses. They are absolutely stunning. Thank you for the chance to win ,and for me to find your blog, i think all the flowers beautiful but the one for me is the poppy ,i have loved them from being a child living in the country and going on long walks in the summer with my lovely parents, such happy memories have i ,of the poppy swaying in the light gentle breeze ....... adorable just adorable . Thank you for this opportunity to win this die set. I love them all but I think the dogwood is my favorite. Have a good day. What to choose. Aren't these flowers adorable? The mini daisies drew me in first. Must be the tiny sizes. Love them all. Wonderful talent. Although the rose is my favorite and this is a very beautiful representation, I would have to choose between the Dogwood and Forsythia. Those were truly amazing. It is so hard to choose a flower that is my favourite but if I do then it would be the poppy. They are all so beautiful! The new dies are great and will help us make realistic flowers. Thanks. The flowers are all gorgeous, but I would choose the smaller flowers like the dogwood and mini daisy since they keep my cards more 'mailable'. Thanks for the chance to win! I love all the flowers. My favorite flower is the rose. Oh i hope i win. These flowers are amazing & I would love to have them ALL but the Sunflower is a favorite of mine in my gardens so that's my pick this time. Selma did a terricfic job & they all look like they could have been hand picked from the garden. As others have commented, all the flowers are just beautiful. But that said, I must say that the sunflower is my favorite. It reminds me of a sunny morning and a day full of promise. I love the Hibiscus flower die because it reminds me of the tropics,and is so delicate and beautiful! I have been looking for the foliage to go with the flowers, thanks for a chance to win them! Love all the cards made by Selma,she does such a beautiful job! Beautiful flowers! I love them all! Can't pick just one! Joan, I love pansy's but the sunflower is so pretty so I'm going with that. Thanks for the chance to win the leaf set. I love them all, but my favorite is the dogwood because it brings back memories of my mother. Beautiful cards! I know I said I loved the Sunflower on Selma's blog but now I think I love the Dogwood. oh I don't know..
Ma favourite flower would be the pink rose - stunning! I did waver a bit on the Dogwood since I live in Atlanta, GA!! I have Susan's book and have really wanted to make violets so I think I have to say my favorite would be the Pansy/Violet. Thanks for the opportunity to win the leaf set! Since I am commenting on both blogs, I am going to pick 2 choices... Equally awesome is the poppy--love the color, too!! The leaves look REAL!!! Thanks for the op to win!!!! First place in my book, is the lovely Rose. It always reminds me of my Mother, as her middle name is Rose. The playful pansies are my second choice, but oh so close to first place. Thank you for the generous giveaway. Hope my name is chosen! Thr pink dogwood has always been a favorite of mine but I also love the roses. Very hard to choose. I love the roses! The are so beautiful and realistic. I can even smell them just looking at them! I have never seen anyone else make such beautiful flowers as you and Selma do. I know having the right tools help, but I think you two ladies have a certain knack to make them - something I do not have. Thank you for sharing such beautiful creations. Always, my favorites are the Sunflowers! My grandmother had them in her yard and I so miss seeing them now that she is passed. I always look for them on the sides of the road when we are out and about. So much color that I know the Lord loved them too! Thanks for offering such a great gift. You are always too kind. I like the dogwood flower. These are all beautiful, but my favorite is the rose!! I have been following this blog for a year now and it never ceases to amaze me with what flowers can be constructed from paper. I would love to win the die set. I love all of the flowers Selma created but roses are my all time favorite.